Definition at line 1264 of file extypes.h. Definition at line 1268 of file extypes.h. Definition at line 1266 of file extypes.h. 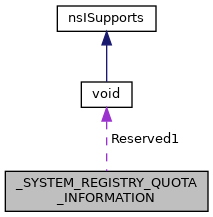 Referenced by GetSystemRegistryQuota(), and QSI_DEF(). Definition at line 1267 of file extypes.h. Definition at line 539 of file winternl.h.